The other day I planted this Eastern White Cedar (Thuja occidentalis) on a slab I picked up from Aichi-en in Nagoya, Japan. I believe the slab is made of concrete, although the artist did a very good job of giving it a natural form and texture. I had the help of a friend who has much more experience planting trees on slabs than I do. I was expecting to have to make a retaining wall out of muck like Bjorn does for a white pine in this excellent video, but I learned that this step is completely unnecessary with healthy Thuja because of its incredibly dense root characteristics. The material should be well established and have a dense, fibrous rootball. Most Thuja can produce this in two years of growth in a coarse bonsai soil such as a lava rock or pumice based mix. Do not disturb the rootball any more than is necessary. In other words, don’t rake the whole thing out. This will weaken the structure of the rooball and will make it difficult to keep it intact once planted on the shallow stone. Remove thick, downward growing roots.Thuja collected from rocky areas typically have few of these, as was the case with this tree. Once the rootball is shallow enough, leave it alone. Trim long, thick roots that extend beyond the desired perimeter of the rootball. Excessively long fibrous roots can be tucked underneath the rootmass once it is placed on the stone. Tie it in tight. Drill more holes if necessary. Work in soil where necessary, If the rootball is dense and was undisturbed, relatively little soil will need to be worked in near the trunk. "Before" (this is actually a picture from last summer). The rootball tied into the stone. I'm guessing only about 25% of the rootmass was removed for this planting. The result. I am happy with the stone and the more upright planting angle. This is actually closer to how it was growing in the ground. This tree still has a lot of development ahead of it, so there is no point in adding moss. No top pruning was done. The tree just looks thinner because it shed its foliage last fall, after the first picture was taken. This is a very dwarf and dense variety of Ginkgo that I picked up at a specialized nursery for a good price. I keep telling myself that I will not buy nursery material unless it is exceptional but it is tough to live by this rule! Ginkgo biloba 'Mariken'. If the layer is successful, this tree will quickly develop into a simple but attractive shohin. Anyway, like most dwarf conifers, this specimen is grafted – and the graft is very ugly. I knew this when I bought it, so air layering was definitely part of the plan. Graft showing massive reverse taper below the bulge. I have air layered a number of trees successfully in the past, and normally start the process in the late spring after the leaves have just hardened off. Of course, there is more than one way to do things in bonsai, and Graham Potter made a video which does a great job of summarizing his approach to air layering. The video can be watched here. Start the layer in the early spring, when the tree is just beginning to show signs of activity. Pack the sphagnum moss tightly against the trunk. Good contact between the moss and the trunk is important. I am keen to try Graham’s approach, because starting the layer as early as possible will give it more time to develop in our short growing season. The one time I tried a Ginkgo air layer, it failed. The tree bridged the ring wound – probably because I did not scrape away the phloem. When I re-opened the wound, the tree died. However, I know that Ginkgo are conducive to air layering because a friend of mine has layered a pretty chunky branch of a specimen Ginkgo yard tree. The ring wound after scraping away the white phloem tissue. The completed layer, packed tight up against the trunk. Hopefully this tree continues to bud out and shows some roots soon! This tree took a step forward over the last couple of weeks, but still has a long way to go. It is one of several Ulmus pumila I got from this old hedge in 2010. As a side note, this winter I ended up with about 10 kg of Robert Stevens’ Bonsai Aesthetics aluminum wire. This is the first tree I actually tried it out on. It is pretty good stuff… only slightly softer than Japanese anodized aluminum with a bit less holding power, but at a fraction of the price. As is typical with aluminum on deciduous trees, I found myself using wire about 1/2 the thickness of the branch to achieve the desired bending power. It is worth noting that this wire is pure glossy black, as opposed to the copper-ish colour of Japanese aluminum wire. It will be interesting to see how the colour stands up to the elements over this growing season. Setting some secondary and tertiary branches with Bonsai Aesthetics aluminum wire. Root work came next. This is the first time that this tree has had focused root work since coming out of the hedge. Almost all of these elms had massive taproots. This one needed some work with the reciprocating saw and a die grinder to further reduce the taproot. Furthermore, a few excessively long roots had to be pruned back. This may look extreme, but every root I have cut back on one of these Siberians has produced new roots near the cuts – even tap roots 15 cm in diameter. Reducing a massive taproot with a reciprocating saw, then a die grinder fitted with a carving bit. The root system of this tree is not ideal, and needs much further reduction, but this is where I left the work for this year. This Nick Lenz pot was the right size for the rootball, but the tree is not planted at the right angle. I'm not concerned about that right now, since this tree is still very much in training. This Elm has an excellent trunk for a classic informal upright design, but the nebari is terrible due to the presence of large taproots. On an informal upright elm, the nebari is one of the most important features. Root grafting may be in this tree’s future. The main purpose of this repot was not horticultural, but rather to adjust the planting angle of this Dwarf Japanese Yew. It has been tough to get this tree at the right angle due to the presence of thick sections of downward growing trunk which I have been rather timidly chipping away at (the tree was developed as a ground layer). You can read more about the history of this tree in my progressions page. This tree has been slow to develop, largely due to the long period of time spent replacing the root system. It is finally at the point now where I can solely focus on its development as a bonsai. It does admittedly have a few years to go before it is show ready. The tree last spring. The tree looks unstable at this angle, and the direction of the first branch is upward. This branch will be pulled down eventually, but correcting the planting angle will reduce the degree to which the branch has to be lowered. The tree before repotting, propped up at the intended angle. After grinding away some of the offending 'root' (which is actually a section of trunk from where the ground layer was separated). Yew develop fantastically dense fibrous root systems. It is important to really open them up during repotting so soil can be worked in. The final bits of original nursery clay were also hosed away. The result. I believe that this is the best angle for this tree. It also went into an aged yamaaki pot which may look a bit small right now, but I think will be ideal when the intended silhouette of the tree is achieved. This tree will not be repotted again for several years. 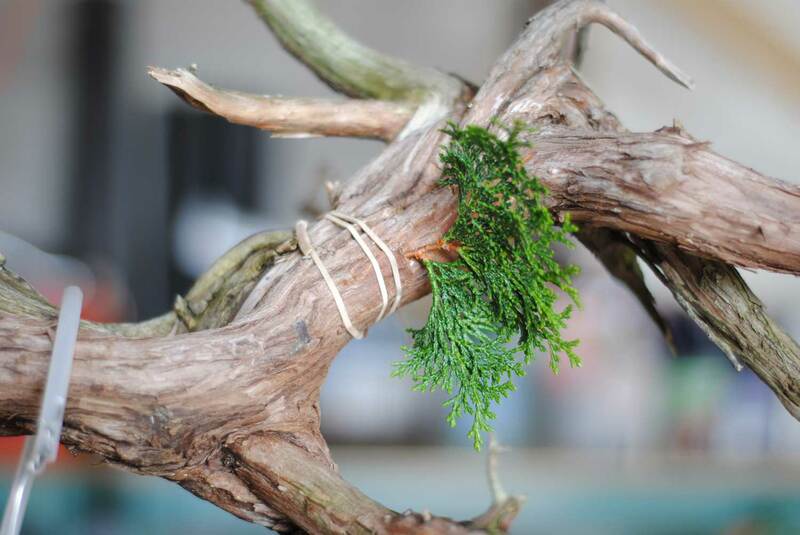 My Thuja are starting to lose their winter colour, so I figured now was as good a time as any to make my first attempt at grafting hinoki foliage to this old bare tree. The type of graft I attempted was a type of side veneer graft, as shown in the image below. Approximate size of the scions used. Hopefully they aren’t too big? I chose the size based on images I’ve seen of people doing the same type of grafting on juniper. A (very tight) elastic band was used to initially secure the scion to the rootstock. This is a nice trick I learned at a recent grafting workshop. It allows you to still “tweak” the position of the scion after it is secured to the tree, to ensure that the cambium is aligned properly. There are special UV resistant elastics designed for this job, but I just used old kitchen elastics. A tight layer of teflon tape went over the elastic to protect the wound. Three grafts in total were attempted. One was covered in a clear plastic bag. For another, the scion was wrapped in parafilm (which apparently breaks down quickly enough that the scion can actually grow right out of it). The last one was left unprotected. Professional propagators don’t wrap their scions in anything, but they also have fancy greenhouses to control their environment. We’ll see what happens. To be honest, I am not feeling very confident about these grafts. I did the best I could, but I feel that I am at a big disadvantage without having a greenhouse. But nothing ventured, nothing gained – right? If these fail, I will try approach grafting and possibly some more side veneer grafting in the late spring. Perlite is readily available and cheap, but I’ve never really used as a soil component because it is too lightweight (floats/doesn’t weigh down the pot) and it is really ugly. However, I’ve noticed that there seems to be a practically religious following in Italy of bonsai growers who swear by using pure perlite for rehabilitating recently collected yamadori. Pinus nigra... once of those "oops" trees that did not exactly come out of the ground as expected. It is amazing that Andrea even bothered to try with this tree. As far as pine goes, this is practically no roots. Here it is budding out. The tree is still alive today! It even has roots coming out of the pot in the same growing season as it was planted. I’m not sure if perlite can be given all the credit for this pine pulling through. Andrea also used a number of tonics when he planted the tree (“radimix, bioxim, and antym kombu40 etc.”), whatever that stuff is. Nevertheless, it is an impressive story. The potentilla that is the subject of this post was collected about 10 years ago by a friend of mine. I have admired this tree for some time, as potentilla’s of this size and drama are quite rare. When I had the opportunity to buy it for a reasonable price last year, I didn’t hesitate! However, this tree has some serious issues and serves to illustrate some limitations of potentilla for bonsai. In a recent post, I said that potentilla are one of my favourite species. They are certainly not perfect, however. Many people will refer to the limited longevity of potentilla. While they are hard to kill, their weedy growth habit is subject to dieback. Their biggest issue, however, is wood rot. This tree is a perfect example of the issues that arise with potentilla over time. When designing potentilla bonsai as a deadwood species, you must be very conscious of the soft wood. It is nowhere nearly as robust as the deadwood of other deadwood species such as Thuja and Juniperus, and requires extra care. This means treating at least once a year with a penetrating wood hardener, and keeping the deadwood clean and dry. This is the product I like to use. These techniques were not applied to this potentilla over the last decade, and as a result it has lost much of its structural integrity as a result of rot. Some of the fine jins near the base of the tree also crumbled away when I first laid hands on the tree last summer. The tree is literally falling apart. To make things worse, was planted in a very mucky organic soil mix which takes a long time to dry out. Crevices such as this are highly at risk of rot, especially if they are not kept clean and dry. This organic soil mix holds far too much water. This rotted the jins that (used to) lay on the surface and also creates too much humidity for the deadwood that lies above the soil. It is worth noting, however, that the tree grows fine in this soil. Potentilla will grow well in almost anything! The video clip below shows the extent to which the rot has compromised the structural integrity of the tree. This is the new pot. It is a yamaaki pot with some signs of age. It is far from ideal, but I think it is a slight improvement on the current pot. I think this tree is ideally suited to a crescent stone, but I have not been able to find the right one yet! Barerooted with the hose and trimmed. You can see that the root system is strong despite the difficulties the tree has presented to the bonsai design. The tree is so "floppy" that it had to be tied to itself in order to achieve the desired angle. This guy wire is hidden at the back of the tree and can be adjusted if needed. Thats it for now. Much cleaning and wood preservation still needs to be done, but I think that the deadwood is much safer now than it was before. The back of the tree is quite interesting as well. As the structure of this tree continues to deteriorate, I am sure that I will have to keep other design possibilities in mind. Today is March 12th, and my Ginkgo is already showing green buds. This means it is the ideal time to repot. This is more than one month earlier than I am accustomed to seeing movement on this tree. The last time I repotted this tree was in 2010, and it was not until April 17th that the buds were starting to move! This seems to be the same throughout the bonsai community… a warm winter means early spring. The ground is already thawed so I pulled out my ginkgo and brought it to a Toronto Bonsai Society meeting. Normally I don't see this sort of action on this tree until mid-late April! This is the new pot, which I got on a recent trip to Japan. It is probably 20-30 years old, based on the patina that is starting to develop. The shiny blue glaze has begun to relax into a complex, matte colour which I absolutely love. The pot has no stamp on it. Nevertheless, it is a very high quality pot... heavy, but with thin walls. It will have no problem standing up to Canadian winters. The tips of the shoots are just turning green, and the tips of the roots are just turning white. This tells me its a good time to repot. All done! I think the new pot is a very nice fit. The old one was great too, and I was happy with it for 3 years. But I think its time for a change. This pot will really make the fall colours pop (unlike the last one) and is also suitable for the winter image. Can't wait for fall! Potentilla fruticosa (Shrubby Cinquefoil) is one of my favorite species for shohin bonsai. In rocky northern regions, interesting specimens are easy to find which can be yanked out of the ground like turnips with a nearly 100% success rate. They are not a particularly common subject, but can still be found in bonsai gardens in most temperate regions of the Northern Hemisphere. I’ve seen amazing specimens coming out of North America, Europe, and Japan. This is one of several small potentilla I collected last spring. In the proper soil they will quickly develop a fibrous root system and are almost always ready for rootwork the following year. Unfortunately (like junipers) collected potentilla may stubbornly hang on to a few long thick roots that can be difficult to chase back. 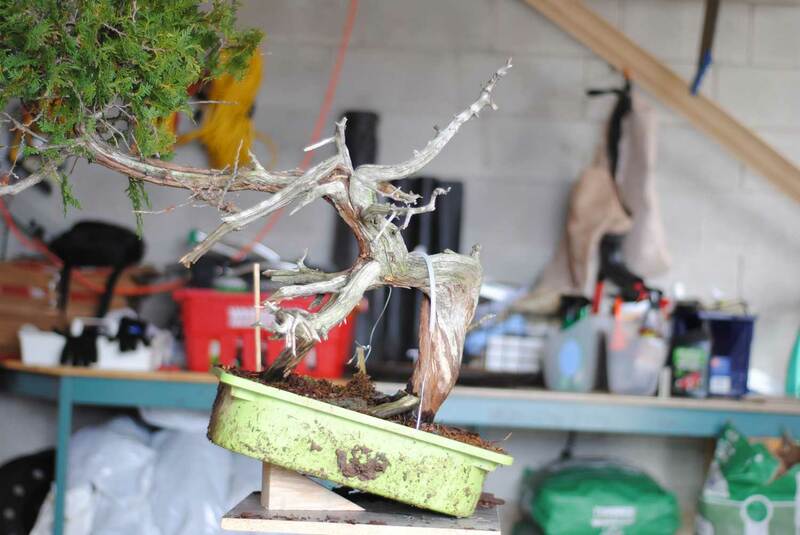 Cutting back roots has to be done with great care because the compartmentalized nature of their growth can lead to dieback of live veins that are critical to the design of the bonsai. I collected this tree because while crawling around in the mud I caught a glimpse of a twisting trunk hiding beyond the weeds and flakey bark. The initial clean up is one of the most important steps with collected potentilla, because you never really know what you have until you remove the bark and punky wood. So here we are, nearly one year after collection, and I finally get to see what I brought home with me! This shaggy mess is typical for collected potentilla. The paper-like bark hides the most interesting features of the tree. It seems that there is some potential with this little tree, but it is impossible to tell until further cleaning is completed and the nebari is exposed. The flakey bark peels away easily with tweezers or using your fingers. It is also necessary to scrape and dig in the many crevices of the tree, where dead bark becomes trapped and rots between the fusing stems. Once the bark is removed, the dancing nature of the trunk becomes clear. It is also clear that this tree is the result of several stems which have fused together at the base. The cleaning process is not nearly complete. Getting all the old crap out of the crevices takes lots of time and patience, and will probably take another couple of lazy summer afternoon sessions of picking and scraping. Nevertheless, the work done here is sufficient to map out the design. The next step for this tree will be rootwork in the next few days. If the root system does not need major operations, it will grow strongly and I should be able to cut it back hard in the late spring or early summer. Potentilla backbud profusely and reliably, but they need to be cut back quite ruthelessly. After that, the deadwood work will come. I intend to reduce the live veins to emphasize the twists in the trunk. It is worth noting that potentilla are ridiculously hardy, and I find they are always the first species to wake up in the spring. Some of mine are already leafing out, 2 weeks earlier than normal due to the mild winter we experienced. I usually repot them when the leaves just begin to emerge, although this is definitely not the only time they can be repotted. Grafted Miyajima White Pine (Pinus parviflora) have a bad reputation because it is difficult to find a specimen with a smooth graft between the black pine base and white pine top. This is probably because the black pine base grows faster and more strongly than the white pine top. While visiting a private garden in Japan, I saw this masterpiece grafted miyajima white pine. The trunk line was practically flawless, with hardly any swelling or unsightly graft transition (unfortunately not visible in the picture). This is rare even in Japan, making this a very special tree. To make things even more incredible, the owner told us that this tree had not been detail wired in nearly 30 years! I found that almost impossible to believe. That would be the ultimate display of bonsai maturity and maintenance techniques. Thuja occidentalis (Arborvitae) is incredibly disease resistant, and there are only a handful of pests that are of any concern to the bonsai grower. One of those pests is the larvae of a tiny moth called the cedar leaf tip miner. Cedar leafminers are tiny moths native to Canada. Damage is caused by the small larvae feeding within the scale-like leaves of cedar. An infestation is usually first noticed in the spring when the tips of some branches begin to bleach and brown. Heavy infestations can cause severe thinning of the foliage. The article goes on to say that the disease is not a major concern but, for bonsai growers, it can be aesthetically displeasing and can also weaken the tree if left untreated. The tree below was collected in late April 2011. I suspect that its recovery left its defenses down, and by August the leafminer had established itself. Cedar Leafminer Damage on a small (25 cm) Thuja occidentalis. The damage is minor, but enough to have affected the recovery of this recently collected tree. Treatment of leafminer is relatively simple. Prune away the damaged foliage, and keep the tree in full sun to promote the recovery of the plant’s defenses. A light application of a systemic insecticide such as imidacloprid will seal the deal. As a preventative measure, Reiner Goebel recommends treating Thuja with a systemic in the spring to avoid unexpected infestations of leafminer. One month later, the tree is sparse, but happy. The tree should be much stronger through 2012, and I doubt the leaf miners will return. It may even be ready for its first wiring by the summer. Had it not been for the leaf miner, the tree probably could have been wired this spring. One thing that I found very interesting on my trip to Japan was the prices of bonsai. Take this stunning little (about 20 cm) japanese black pine below for example: it set the owner back ¥1,000,000 (about $12,500). A cool million yen in the palm of your hand. I wonder if this tree would sell for $12K in North America? Europe? Maybe that isn’t even a fair question to ask given the difference in the markets for bonsai. The bonsai in question. The owner has had this tree for 3 years. He believes that it has not been repotted for 8 years, and had reached the point that water could no longer penetrate the root ball. As a result, the tree is weak. The kanuma soil has almost completely broken down, and the pot was absolutely crammed with the fluffy roots that are characteristic of azaleas. The first step after removing the tree from the pot was to clean away the surface soil. One of the most important tasks in the repotting was cleaning out the bottom of the rootball, all the way up to the base of the trunk. This area is most prone to rot, so cleaning it out well allows it to be inspected and refilled with fresh coarse grade kanuma. About half of the excavation is complete here. 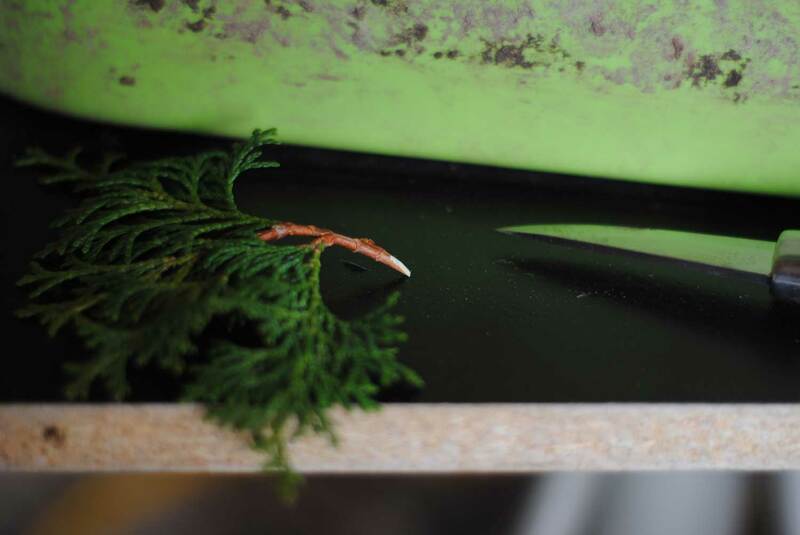 A saw was used to trim only about 1.5cm of roots all around the perimeter. Since the tree is weak, a more aggressive root reduction may have been detrimental to the health of the tree. All hanging superfluous roots were carefully trimmed back so that they were flush with the rootball. This picture shows the extent to which the bottom of the rootball was excavated. With such a deep "pit" in the bottom of the rootball, simply making a mound of soil in the bottom of the pot is not good enough. Thee tree was held upside down and coarse soil was filled into the cavity. A chopstick was used to fill all of the voids. This is a step that is unique to trees with mature root systems - particularly azaleas. The tree was securely tied into the pot, and the pot was submerged in water for several minutes, thus completing the repotting.